Have you already planned to spend your holidays in Val Gardena? On this website you will find all necessary information to plan your holidays in every detail. It includes information about the accommodation, hotels in Val Gardena the skiing areas and skiing regions as well as the hiking trails and a large photo gallery of Val Gardena with its villages Ortisei, S. Cristina and Selva and the Dolomites. You can also check on the weather in South Tyrol. You don’t know how to reach your holiday destination Val Gardena or you haven’t found yet the ideal accommodation for you in Val Gardena? On this web site you can pick from an extensive list of hotels, pensions, apartments and bed & breakfast accommodation facilities. All accommodation facilities are at a stone’s throw from the slopes in winter and in summer you can just put on your hiking shoes and go for it. If you like to move a little further, then there are different bus services at your disposal, so as to give you the possibility of not touching your car at all during your holidays. Are you a sport enthusiast and are you looking for the various sports and sport related services offered in Val Gardena? 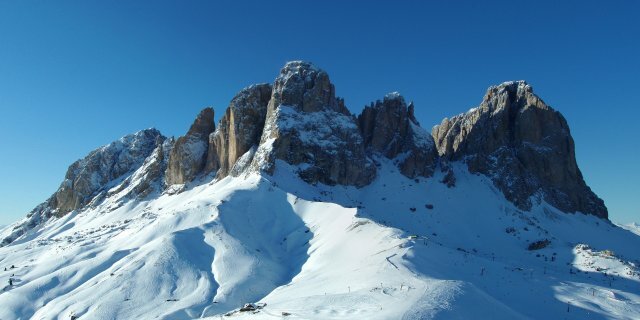 Then click yourself through the large array of interesting winter and summer sports which you can enjoy in Val Gardena! The ski and snowboard enthusiasts among you will find right here all the information needed about the various skiing areas and skiing regions and the famous Sellaronda, the ski pass, cableways and lifts, ski guiding, ski schools and ski hires, ski busses and après-ski mountain huts. Apart from taking in the fantastic fairytale winter landscape by alpine skiing you can go cross-country skiing, ski touring or snowshoeing. Also the snowboarders will be perfectly served as they can choose between freeride, freestyle, and freecarve/race on normal or boarder cross slopes or even on half pipes in fun parks. We sure didn’t forget about the ice skating and sledging fans among you and enclosed a list of the various ice skating and sledging possibilities in Ortisei, S. Cristina and Selva in Val Gardena. In summer, hiking fans can take advantage of the Valgardena Card, a ticket which enables you the unlimited use of the cableways and lifts and the various bus services, including the Sellaronda Bus, in order to enjoy thoroughly the hiking paradise Val Gardena! You will be guided safely through the breathtaking scenery of the Dolomites by using a handy hiking map and our experienced alpine guides will be pleased to discover with you the mountains and their flora and fauna on unforgettable hiking- or climbing tours and vie ferrate. Besides living the beauty of nature in Ortisei, S. Cristina and Selva in Val Gardena by hiking, you can choose between many other outdoor sport activities such as Nordic Walking, mountain biking, golfing, miniature golfing, riding, and fishing. Of course you can also go playing tennis and squash and spend your time with athletics, swimming, climbing in the boulder hall or working out in one of the many gyms in the valley. After an intensive day on the mountains you are for sure ready for some soothing hours in the sauna or a gentle massage session in professionally equipped wellness paradises. Many of the accommodation facilities offer various wellness services. There are also several wellness and beauty centres in Ortisei, S. Cristina and Selva and there is a fantastic sauna and swimming pool complex in Ortisei which is definitely worth a visit. Spending your holiday in such a beautiful many-sided area, make sure you don’t miss to learn more about its deep-rooted culture and to visit the numerous places of interest. Moreover, there are plenty of attractive shops waiting on you in which you can spend relaxed unhurried hours before you take part in one or more of the many events taking place all year round in the three villages of Val Gardena: Ortisei, S. Cristina and Selva. If you are looking for the right child care place for your children while you are skiing, hiking, enjoying a wellness afternoon, shopping or else, then be sure to contact our day nurseries in Ortisei, S. Cristina and Selva. A competent, friendly and flexible service is waiting on you and your children! Check also out the many perfectly equipped playgrounds in the whole valley. Are you a gourmet? We put together a long list with traditional mountain huts and refuges and exquisite restaurants and pizzerias where you can taste typical South Tyrolean and Mediterranean dishes! Moreover, on this web site you can find all important telephone numbers which could be useful during your stay in Val Gardena!